This soup is so light and refreshing. It really is. You can tell just by looking at it, can’t you?! 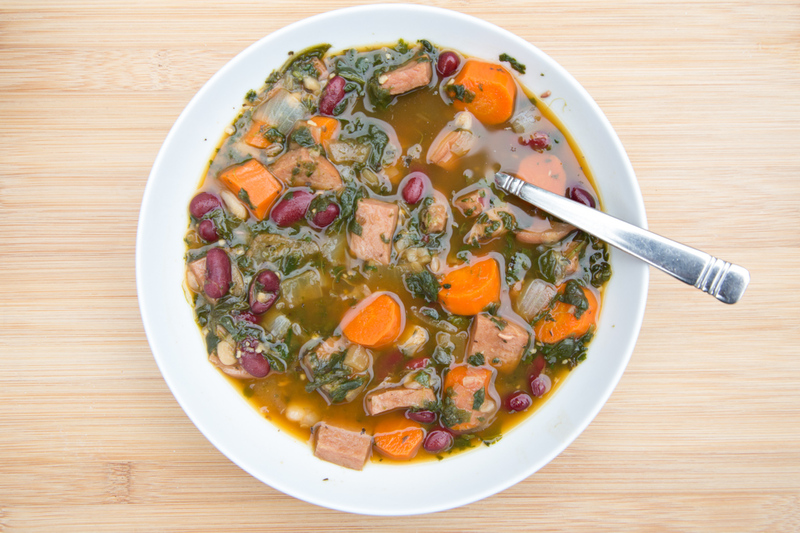 A ham and bean soup with just the right amount of veggies. Bonus points if you use leftover ham. Triple bonus points if you used ham that you bought on sale before Easter to make more meals with – like this one! Toss it all together into the Instant Pot, set it for a few minutes, and then top it all off with a few pinchfuls of a rich shaved or shredded Parmesan cheese. Chop the white onion. Peel and chop the carrots. Add all ingredients except the garnish and side dish to the EPC insert. Warm the loaf bread or dinner rolls. Serve Instant Pot Tuscan Ham & Bean Soup with warm loaf bread or rolls and butter.